Following a trend for online auction sales of real estate, a home in Lincolnville was sold on April 3, 2019, via an online auction. It overlooks Penobscot Bay. 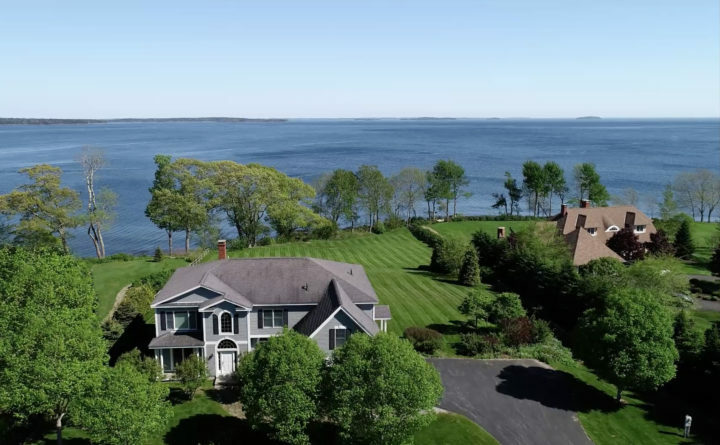 Following a trend for online real estate auctions, a Lincolnville home overlooking Penobscot Bay sold in an online auction April 3 after the owners had tried unsuccessfully to sell it through conventional real estate methods. The property at 29 Waters Edge Drive sold for $638,400 and had 21 bids during the auction, which ran from March 27 until 2 p.m. April 3, according to the auctioneer Paul McInnis’s website. The home was slated to sell for the highest bid over $300,000, so even $1 more qualified as a successful bid. The high bid by an unnamed winner was $570,000, to which a 12 percent buyer’s premium was added to total $638,400 for the total price. The sale is expected to close within 45 days. Hathorn said the home was bought by someone from Maine who was within reasonable proximity to the sale property. Hathorn’s company partnered to sell the property with auctioneer Paul McInnis of North Hampton, New Hampshire, which has a license to operate in Maine. The Lincolnville town tax records list Yvonne and Robert Walker as the owners of the property that was sold. Online auctions are used more often for commercial and retail real estate, for example, the recent Bangor Mall auction. Only recently are residential homeowners using them to sell property. That’s partly for the owners’ convenience, and because online auctions also can draw a broader pool of potential buyers, Hathorn said. With successes like this sale, Hathorn said online auctions are gaining traction. The home, which was custom-built by the owner in 2003, has five bedrooms, 4½ bathrooms and a total of 3,559 square feet. It includes 1.36 acres and has 193 feet of ocean frontage. The home had been on the market for more than a year, with a starting price of $1.25 million. But that dropped to $898,000 before the buyer put it up for auction. Qualified bidders had to make a $10,000 deposit before the auction. The auctioneers also held open houses in late March for potential buyers to see the home. Other ways to auction a home include the more traditional onsite bidding used by sellers such as Newcastle Realty of Damariscotta. But both types of auction are not always successful. The unpublished reserve price on the Bangor Mall online auction was not met when the auction closed in February. Nor was the unspecified reserve price met for a property auctioned onsite last July by Thomaston Place Auction Galleries in Thomaston. The home at 311 Murphy’s Corner Place on the Brookings Bay waterfront in Woolwich is now being sold for $1.17 million by Newcastle Realty of Damariscotta, according to Mainebiz. That’s reportedly significantly less that the reserve price last summer.